After five years of a Tory Government, David Cameron will leave the family in a far stronger position than he found it. Almost every problem facing society today can be traced back to the disintegration of the family unit and the chaos and problems that it creates. All of the policies we have articulated from education, the economy, to marriage, in some way underpin the family and its importance within society. My guess would be that those policies, to be announced on a daily basis in January, will be rooted in what has already begun - a campaign to re-instate and protect the family at the heart of a decent British society. With the problems facing our society today, I can't think of a better objective for any future Prime Minister or a more important and uniting message to wrap around each and every policy announcement. I have been asked a dozen times today why I think Sally Bercow gave that interview yesterday. I think it was a staged interview, managed by those in the shadows of the Labour party, and was a strategic measure in kicking off Labours new ‘class warfare’ campaign. Who cares about Sally Bercow’s past? Do we really believe she was concerned that one of her one-night stands, from a booze fuelled liaison, sometime in her long ago past was going to surface and spill the beans? Really, do we? Would anyone be remotely interested? Was this really her motivation for the interview - concern that her effort in fighting an un-winnable Labour council seat in the midst of a Conservative heartland might be scuppered by a kiss-and-tell, long forgotten lothario? I believe the interview was motivated by a desire to attack David Cameron for something he hasn’t done based on the new class-attack agenda - criticising him for the fact that he may one day consider sending his children to a private secondary school. Bear in mind his daughter is state educated and a long way off the secondary school stage. Ironic, when you think that half of the Cabinet, including Straw, Balls, Darling, Harman, Jowell, etc were all privately educated and the other half privately educate their own children. Should it matter whose children are educated where? No, it shouldn’t. Not a jot. However, after Sally Bercow’s interview yesterday it's all eyes on the register. The remainder of the attack on David Cameron was purely personal, however, for the woman who claims to have been inspired by Tony Blair to join Labour, to then accuse David Cameron of spin kind of takes one's breath away. The Bercow’s cannot distance themselves from the harm this interview has done. Whilst in my constituency today, everyone I met, of whatever political persuasion, registered their distaste. People were disgusted. The office of Speaker is now as low as it can go. How can we trust the man expected to set the standards in Parliament, the person who holds us to account, to have any sort of judgment when he obviously must have thought this interview was a good idea? 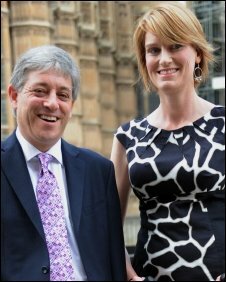 If Sally Bercow were married to a plumber from Putney and standing for a council seat no-one on the national political stage would be remotely interested in what she said, however, she isn’t. She is the Speaker’s wife and she and her children live in a Grace-and-Favour apartment within the Palace of Westminster. She may have decided she had no interest in her husband’s constituency or the schools his constituents and voters send their children to. As the Speaker’s wife, however, she has standards to up-hold. Like it or not, it’s how it is. We have seen what happens to Parliament when standards of behaviour are ignored or dismissed as irrelevant. God forbid we should ever end up there again. Such a disregard for standards from within the Speaker’s apartment does not bode well for the future. I hope they consider their option to recall him and his wife to explain this interview and consider fully their options. When a new Parliament sits, we MPs, at a strategic moment, have the opportunity to shout ‘No’ when the motion to re-instate the Speaker is announced. I reckon it’s going to be a fairly loud chorus. The interview was given in the Speaker's apartment in her role as the Speaker's wife. If Sally Bercow had been standing for an un-winnable Labour council seat in a safe Conservative ward and had been married to anyone else, no-one would have been remotely interested. In one interview she has eroded any progress Parliament had made towards restoring its lost integrity and authority. The Speaker, the man who holds Parliament and its Members to account, has displayed a serious lack of judgment in allowing his grace-and-favour apartment to be used for such an interview. His future tenure of the historic Chair must now, more than ever, be in question. To have used the Speaker's apartment in the Palace of Westminster to personally attack David Cameron, the man who may be the next Prime Minister, to criticise him for something he may or may not do in the future in terms of his children’s’ schooling, is also offensive and sheer hypocrisy. This is especially so when many Labour MPs are privately educated and privately educate their own children (something David Cameron doesn't and may not do). Her admission regarding her ‘ladette’ behaviour is something Parliament just didn't need right now. A bad day for all of us. On Sunday morning I'm being collected by Channel 4 at 8am, and being delivered with a film crew to a tower block housing estate somewhere in London. I have no idea what is happening, where I am going, or who I will be staying with - although I think I'm staying with a number of different people on various nights. Upon arrival, my personal possessions, including my clothes, money and mobile phone, are being taken away. Love productions, on behalf of C4, are providing the clothes I need when I arrive. I know that problematic situations have been 'set up' but I don't know what they are. I'm there for a whole week. Security will be with us the whole time, even when sleeping. One of the objectives is for me to experience the problems that the residents have to face on a daily basis and for residents to challenge and get to know an MP. The programme is being screened at prime time in February in four one hour programmes, one night after the other. If I said I wasn't scared, I would be lying. The unknown is always a little frightening and I know that two of the other three MPs who have been through this have faced some very alarming situations, which have justified the presence of the security firm. However, I regard this as both a challenge and an honour. The irony surrounding the first pre-record interview, which took place last night just before I went to meet a friend at a restaurant, carrying a bag of Christmas presents, was not lost on me. I will be swapping my ivory tower in <?xml:namespace prefix = st1 ns = "urn:schemas-microsoft-com:office:smarttags" />Westminster for a tower block in London – the kind of accommodation that houses many thousands of people across the UK. These are people who may be in a constant state of being overwhelmed with the sheer scale of problems they face on a day-to-day basis. My objective for the week is to survive. To learn as much as I can. To leave something behind, even if it's only friendship. That won't be easy, as being out of contact with the girls will be tricky on an emotional level to begin with. And so I have to prepare. After tomorrow there will be no more blogs or Tweets from me until I return. I've told my girls not to worry. The only violence likely to occur is if C4 try to prise my mascara wand out of my hand. Security will be necessary then! Big time. I am reading Isaiah Berlin and was thrilled to read the following, regarding the power of ideas and the individual, from my own perspective due to the ability of an individual to create or transform. I don’t understand why he used the words ‘professor's study’. In a democracy, it could be the idea or ideas of any resourceful citizen which could destroy a civilisation, and sometimes do. Christmas is a tough time for parents. Many cross their fingers and hope that they can survive until the end of January to cushion the blow of the additional expense Christmas has incurred. It’s even worse for single parents who take that responsibility on their own shoulders with no support financially or emotionally. As a single parent myself, I know how tough ‘going it alone’ is and I know only too well how many sleepless nights come with that package. I doubt there are many single parents who would say that they much prefer that option to having someone by their side, to share both the responsibility, the work load and the pleasure of family life. I am proud that David Cameron and my party are the strongest supporters of marriage in Parliament today. The speech given yesterday by the Government-funded Family and Parenting Institute head, Dr Rake, sounded a strong death knell for the traditional family – in fact, she went even further and used her speech to warn politicians against encouraging traditional families and marriage. It may be the case that many children today are born outside of marriage and are cared for by relatives. If we were living in a strong, communal, neighbourly society and the country had strength, purpose and direction with few problems, then I agree, it would be very hard indeed to fight the marriage corner when the erosion of the family appeared to be having little if any impact. As we all know, however, it’s just not like that. Our society is, in many parts of the country, completely broken, to the extent that many of you reading this would not think possible. Marriage as an institution has worked well for thousands of years; it is the bedrock of a strong society. It provides the ideal framework in which to raise children, as evidence shows, and it’s not about politics. It’s about two people setting off on a journey together, to share and enjoy the future trials and tribulations of family life, providing the boundaries of security within which children thrive. As I began, Christmas is a tough time or families, It’s tougher still when you are on your own. The Government need to examine why it is that so many marriages are breaking down and, as David Cameron is doing, look at ways to support and encourage marriage. That’s the difficult and challenging option. Gordon Brown has chosen the easy way out, appointing a quango head to announce the end of the family as we know it which, if believed, removes the problem from his shoulders and distances Labour from twelve years of policies which have systematically undermined the family. No 10 may look upon yesterday’s speech as a tribute to a job well done.